Black Boy Inn HotelThe Black Boy Inn, Caernarfon, North Wales, have been offering hotel accommodation and dining of distinction for more than five centuries. Situated within the historic town walls of Caernarfon, within easy walking distance to the town centre and famous 13th Century Castle. 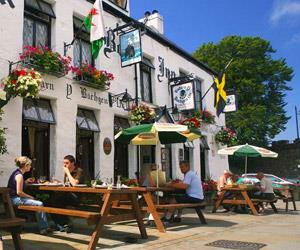 The Black Boy Inn, Caernarfon, North Wales, have been offering hotel accommodation and dining of distinction for more than five centuries. At the Black Boy Inn we have the breathtaking beauty of North Wales on our doorstep, with something to suit every taste. You don’t need to travel far to take advantage of the numerous attractions Caernarfon and the surrounding area has to offer. For instance, it is just a minute's walk to reach Wales' most magnificent castle; a looming, fantastical World Heritage Site built by Edward I as a medieval show of English strength. Nine hundred yards further is the starting point of the Welsh Highland Railway, offering a journey on one of the world's most powerful 2' gauge steam locomotives. A few miles' drive is Snowdonia National Park which plays host to the highest mountain in Wales, and Anglesey, home of Beaumaris Castle, the last and largest of the castles to be built in Wales. By Car: From London allow 5 hours for your journey. Exit the M6 (J20) onto M56. Follow signs for North Wales / Queensferry onto A55. Exit A55 (J9) onto the A487, following signs for Caernarfon. On entering Caernarfon you will pass Morrison’s on your right. Take the fourth exit on the roundabout and then the first exit on the next roundabout. Follow the road ahead until you come to a junction, the Black Boy is straight ahead of you within the town walls. The Black Boy Inn is located between Caernarfon’s Castle and Victoria Dock. The Black Boy Inn believe their guests should be able to make an informed decision as to whether their premises, with its characteristic low ceilings, narrow corridors and exposed beams, meet their particular access needs. The Black Boy Inn's access statement provides a summary of provisions and can be downloaded from their web site.